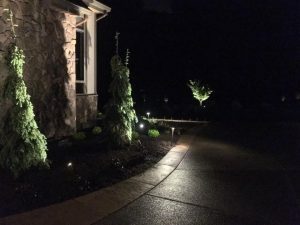 Landscape lighting with led Woody's Custom Landscaping, Inc.
Landscape lighting with led lights is a great way to enjoy your landscaping all the time. 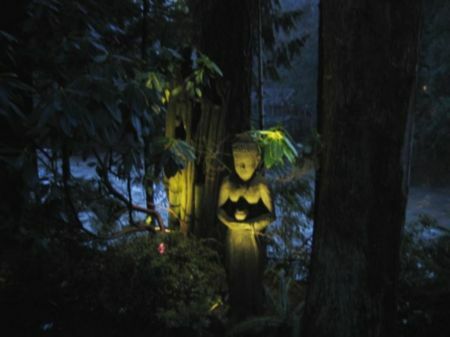 At night your pathways are lighted. Trees can be up lighted and outdoor living areas can be enjoyed even in the darkest conditions. Why not enjoy your garden all the time and not just during the day. 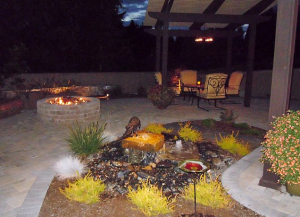 This outdoor living area can be enjoyed in both daylight and at night with led landscape lighting. Note the chandelier over the table is lit with led. There are many ways to light up your home with led landscape lights. The most common lights used are path and up lights. 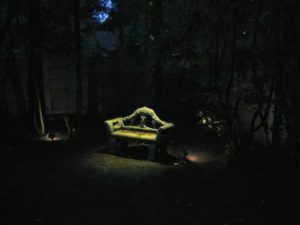 Down lighting while not used that frequently, really can add a lot of drama to your landscaping at night. Note the photo below. It’s pretty easy to not where to sit with path lights and a down light over the bench. Note the lighting along the wall. When doing an estimate for clients who wish to have led landscape lighting. I normally point out that very elaborate lights with tulips and scroll work aren’t that necessary. Landscape lights are really not to be noticed during the day, but at night. In other words, it is all about how the lights deliver at nighttime. 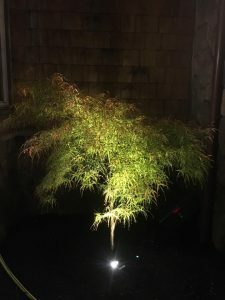 Here is an example of up lighting a Japanese Maple wit led landscape lighting. Pretty with leaves and in winter. Landscape lighting with led is something to consider for your landscaping. The current wave is all about outdoor living. Why not enjoy your backyard landscaping at night also?